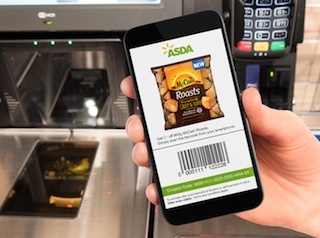 Mobile marketing and commerce provider Weve has partnered with real-time digital promotions software company Eagle-Eye Solutions to launch ‘smart scanner’ mobile coupons with nationwide campaigns from shopper media agency Capture’s brands including McCain Roasts. The coupons allow customers to redeem offers straight from their smartphone without the need to print a paper version. It also means that advertisers can track redemptions in real-time and provide more personalised and relevant offers to customers. The coupons system was developed by Weve in partnership with SaaS software company Eagle Eye Solutions, which specialises in the real-time validation and redemption of digital promotions. Weve simply sends a text message to customers, on behalf of the advertiser, with details of the offer and a link to the coupon. Once customers click on the link, they are taken to a barcode, generated by Eagle Eye, to scan at the checkout directly from their mobile, to redeem the coupon immediately.